Every season, Texas has at least a few amateur players added on tryout contracts. Many of these are drafted players getting a taste of the AHL before heading home for the summer. In 2015, I wrote a story about Texas’s ATO tradition for TheAHL.com. Not every one of these players will sign an ATO this season; this is just the list of possibilities. Keep in mind that the Stars also usually add at least one player from college (generally a Michigan college) who was undrafted, such as Joel L’Esperance and Robbie Payne last season. The Flint Firebirds are not making the playoffs. We can say that pretty confidently as they’ve been the worst team in the OHL for basically the entire season. Their one bright spot has been the play of Dallas’s first round pick in 2018, Ty Dellandrea. Despite being only 18, the center is eligible for a spring AHL stint as he is signed to an NHL contract and his amateur season will be over at that point. As of this writing, Dellandrea is 19-37=56 in 52 games for the Firebirds. With Texas hurting at forward, Dellandrea will absolutely play. His final regular season game this season in Flint is on March 17th. With Dallas unable to score at times, many fans have pointed to Robertson as a solution. While that represents a pretty significant misunderstanding of call up conventions, having Robertson join the AHL club this spring is possible but not probable. Since being traded to Niagara, Robertson has 61 points in just 29 games. He was traded, of course, to solidify Niagara’s position in the OHL and cement their likely berth in the conference finals. Unless Texas goes very deep or something unexpected happens in the OHL playoffs, Robertson is going to be playing big minutes in Niagara this spring. That’s what Dallas would prefer for his development anyways. The team ahead of Robertson’s IceDogs? That would be Tye Felhaber’s 67s. Felhaber was an undrafted pickup midseason by Dallas. While they have not officially announced the signing, it has been reported by The Athletic, and the team has not contradicted the reporting. Felhaber has an eye-popping 55-43=98 in 59 games. However, Dallas certainly hopes that he and Robertson meet in the OHL conference finals. When drafted last summer, Loewen was a great story. He was an overage draft entrant at 20 years old and has joint Canadian and Jamaican citizenship. He is the captain of the Blazers this season. The WHL follows the NHL’s division/wild card playoff format and Kamloops is right on the line for a wild card position, trailing the last team in by five points with two games in hand. Loewen is 21-12=33 in 48 games with Kamloops last regular season game on March 16th. This is his overage year, so it’s his final WHL season no matter what. Hawel’s Storm have already clinched a playoff berth and currently sit fourth in their conference. The fourth rounder is a prolific point producer with 33-35=68 in 57 games. Same things apply here as apply for Robertson. Dallas would rather Hawel play big meaningful minutes in the OHL playoffs than sit in the press box in Cedar Park. Still, if the Storm are knocked out early, I would circle Hawel for an ATO. Red Deer is tied for the final wild card spot in the WHL’s Eastern Conference. Davis was traded mid-season from Kootenay, currently owners of a .267 win percentage, to Red Deer. Since then, he’s exploded offensively, earning 11-14=25 in 32 games. Again, if his team doesn’t make it, he’ll be strong candidate as this is his fourth year in major junior. The Rebels’ final regular season game is on March 17th. College is a little bit more of a wildcard because the players can’t sign anything until they are completely ready to be done with college. Amateurism rules in the NCAA apply here just the same as football. Therefore, none of the below players have been signed. Gardner is a hard-nosed forward for UND. The Moose Jaw native, whose 24th birthday is today, has 14 points in 31 games this season. UND is under .500 on the season, but the playoff format of the NCHC gives anyone a chance to win the conference. The first round of the conference tournament is the weekend of March 15-17 with the whole thing wrapping up by March 23rd. UND is also ranked 20th in the nation and a good conference tourney showing could put them in the national tournament conversation. Tufte’s UMD Bulldogs are in much better shape in the tournament conference than UND. Owning second place currently, they are likely to make the national tournament regardless of whether they win the conference tournament. They rank 3rd in the nation currently behind conference rival St. Cloud State and Massachusetts. The Frozen Four tournament concludes April 13th. Tufte has 13 points in 30 games this season. Often mentioned as the goalie of the future for the Dallas Stars, Oettinger has been the starter and alternate captain for his BU Terriers this season. The Terriers are midpack but will play in the Hockey East tournament, which ends March 23rd. BU won last season. There has been some rumbling online about Cecconi’s potential to eschew his drafted team and move forward as a college free agent. Dallas does not seem concerned. They like the player. Cecconi (3-16=19 in 32 games) is the shutdown guy for 2018 first rounder Quinn Hughes (VAN). Michigan is having an off season but the same rules apply where every team has a shot in the conference tournament. The Big Ten tourney ends March 23rd. Players coming in from Europe are most likely to get practice time, press box time and get their development plan for the summer. Having played a full season against grown men, Dallas doesn’t usually play these guys. Notable exceptions would be Mattias Janmark and Mattias Backstrom. Linköping is on the edge of qualifying for the best-of-3 for the last two playoff spots in the SHL. Karlstrom, who has 4-6=10 in 38 games, would be occupied until mid-March in that case, longer if the club is successful in making the 8-game portion of the playoffs. Stenqvist (6-14=20 in 49 games) is in the SHL’s second league, Allsvenskan, where Björklöven is neither likely to make the playoffs or be relegated. As such, Stenqvist’s season figures to be over when the regular season ends on March 8th. Texas got everything it needed in an action-packed first period, but that didn’t mean there weren’t a few tense moments late. 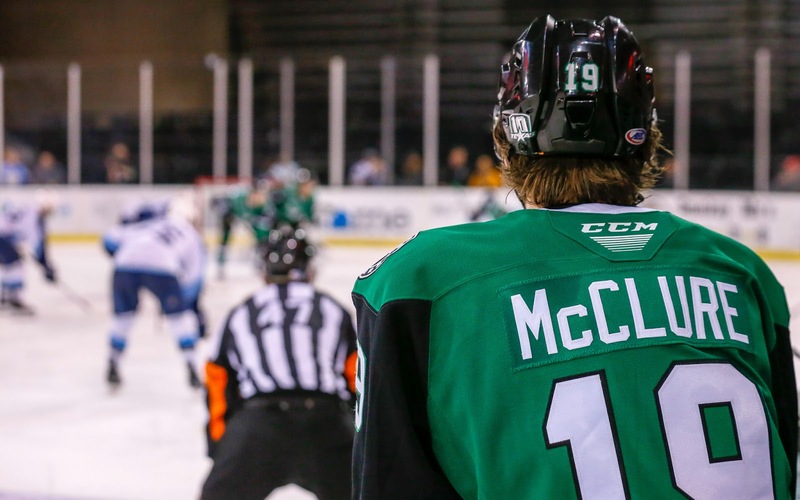 The Stars scored three in the first ten minutes of the game, shelling Tom McCollum and earning a 4-2 final at H-E-B Center this evening. It was a big night for rookie Brad McClure, who scored a pair of goals, including the game-winner on the power play. The Stars opened the scoring on the very first shift. Captain Justin Dowling dished to Michael Mersch on the left wing side, where he polished off the play behind McCollum just 35 seconds in. Texas wasn’t done as Brad McClure stepped up to the plate. Texas management really likes him as a player and feels like he’s getting himself going in the way they expected with tonight’s output. He had 39 points in 42 games with the Steelheads before callup. McClure was the beneficiary of a deft play by James Phelan, who protected the puck from the Milwaukee defense long enough to dish to his fellow rookie at the net. Trying to spark something, Duncan Siemens looked for a fight with Adam Mascherin and actually clocked the Texas forward bareknuckled. Mascherin was not engaging, and Siemens found himself in the box. McClure stepped up again on the power play, backhand crushing on off the pass from the very same Mascherin. Milwaukee chipped away at the Texas 3-0 lead throughout the rest of the but was ultimately unable to mount a complete counter-assault. Yakov Trenin made it 3-1 after the end of forty, and Adam Helewka’s power play goal in the third made it close. Former Texas Stars coach and current Milwaukee head coach Karl Taylor would pull McCollum with 1:25 left in regulation, but nothing would come. Erik Condra drained one into the empty net for the final 4-2 score. Texas is next in action on Friday against Chicago. Texas played Shane Hanna at forward tonight. 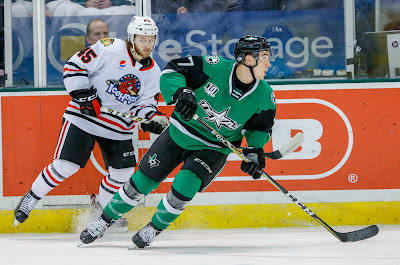 Note: We have removed Roope Hintz and Taylor Fedun from the call up list, as neither was on the Texas Stars roster Monday and cannot play in the AHL for the rest of the season. 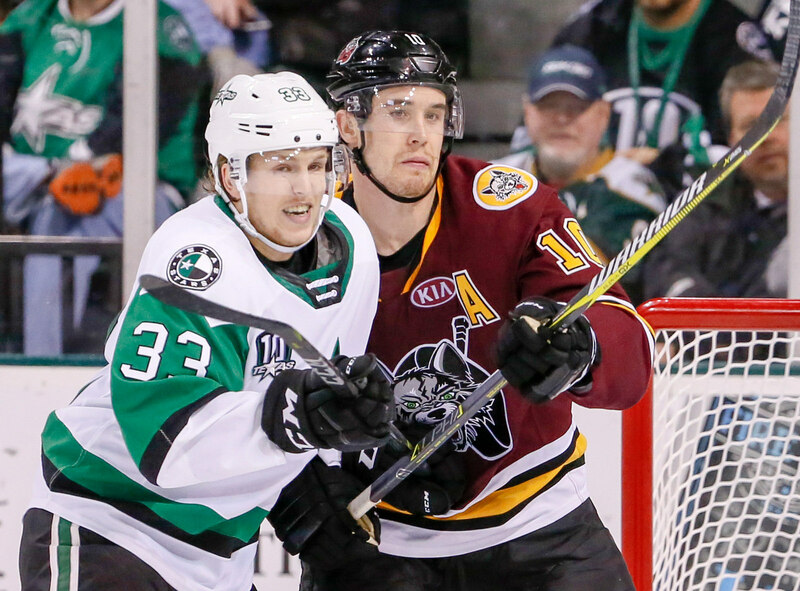 Update: Dallas recalled Joel L'Esperance this afternoon. 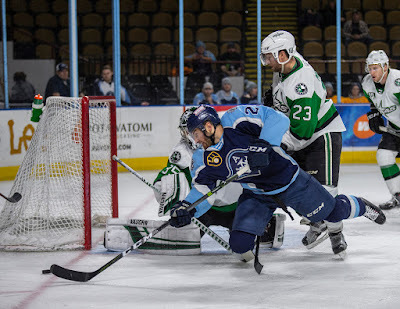 No matter how you feel about the Texas Stars' recent performance, you can be glad that you're not where the Milwaukee Admirals are right now. Riding high for most of the season, they've been brought low. Since and including their shutout loss at the hands of Landon Bow on February 6th, they've gone 1-4-3 and are 1-4-5 in their last ten overall. They've got a crazy high 11 overtime losses, leading the next highest by 4. It's the perfect time for Texas to pounce. Milwaukee is tied with the Stars at 58 points, but Texas has the edge in games played. They will be without the services of Denis Gurianov and still a bit banged up at forward with Markison and Laberge out. The grind starts now. One other note to look out for is the decision in net. Landon Bow seemed a bit shaky coming back this weekend, but I don't think it shakes Laxdal enough to not play him as the starter in most situations. The recent string of play by Desrosiers, however, does give Laxdal that option if he chooses. Once again, I had the opportunity to write for the AHL's On the Beat feature. 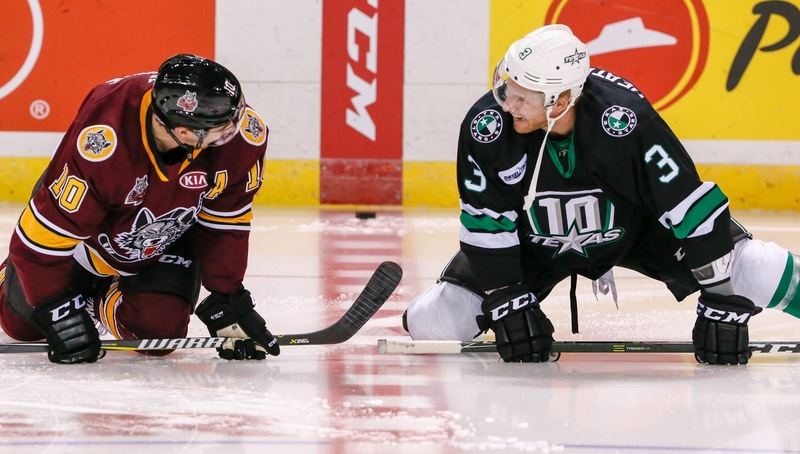 This time, concerning Texas Stars captain Justin Dowling. Justin Dowling did not have the easiest path to where he is today, but the captain of the Texas Stars knows that he wouldn’t be there without the struggle along the way. Dowling was an undrafted center out of the Western Hockey League’s Swift Current Broncos in 2011. He had a fine first professional year splitting between AHL Abbotsford and ECHL Utah, but then the lockout hit hockey. “The trickle-down effect came all the way to the minors and down to the ECHL as well,” said Dowling, who didn’t have much tale of the tape to sign a contract just when things got tight. Idaho head coach Brad Ralph took a flyer on the second-year forward, and he took off, racking up 46 points in 34 games. Following the deadline and injury to new acquisition Mats Zuccarello, the Dallas Stars have recalled Denis Gurianov to the NHL. As he was on an AHL roster today, he is eligible for the remainder of the AHL season in any case. Gurianov, 21, has recorded four points (1-3=4) and an average 11:14 of ice time in 19 NHL games with Dallas so far in 2018-19. He has also skated in 39 AHL contests with Texas this season, registering 37 points (14-23=37). The winger ranks fourth on Texas in assists (23), shares fourth in goals (14) and ranks fourth in points (37). The Dallas Stars were quiet today as the NHL Trade Deadline came and went. There were no moves affecting the Texas Stars throughout the trade season. The big swing for Zuccarello involved only draft picks, not prospects. The AHL trade deadline is exactly seven days after the NHL deadline, March 4th at 2 PM Central. Players on AHL contracts can be traded inside the AHL. Players on NHL contracts can be reassigned by their NHL team to another AHL team and play there for the remainder of the season and the playoffs. This is how Kevin Henderson won the Cup with Texas while on contract to Nashville. All moving and shaking must be done by the deadline on March 4th regardless. Another bit of logistics is the eligibility for the remainder of the season. To be eligible for the rest of the AHL season, players must have been on an AHL roster at 2 PM CT today. Many teams send players down in paper transactions and then immediately recall them to make them eligible. Today, the Dallas Stars did not 'paper' Roope Hintz to the AHL, which means he cannot play for Texas for the rest of the season. He is a Dallas Star now. 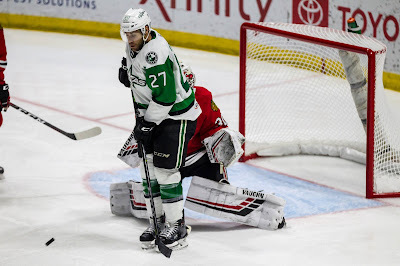 Down the road from the United Center, where the Dallas Stars picked up a 4-3 victory over the Chicago Blackhawks, the Texas Stars struggled to match their parent club in a 4-2 loss to the Wolves. That leaves Texas with a 1-2-0-1 record for this road trip. It was good to see forward Joel L’Esperance back with the AHL club, as the rookie sensation picked up right where he left off with two power play goals in the third period. The tallies gave L’Esperance seven goals in his last seven games with Texas. His first came when Texas was down 3-0 six minutes into the final frame. Erik Condra and Ben Gleason recorded the helpers on the play. The second goal was too little too late, as it came with just over thirty seconds left in regulation, and Chicago’s Dylan Coghlan closed the door on any comeback bid with his goal three minutes after L’Esperance’s initial tally. The final score and shot totals did not adequately reflect the competitiveness of this game. The Stars looked gassed in the early going, and the Wolves made them pay for their mistakes. In the end, the Stars amassed forty shots on net, but Chicago sat back quite a bit when they went up by three goals. Oskar Dansk was also brilliant in net for the Wolves and made several ten bell saves. On the other end of the ice, Landon Bow was pulled in favor of Phil Desrosiers after a rocky period and a half. It seemed that head coach Derek Laxdal made the move moreso to jolt his team than to send a message to Bow, seeing that he wasn’t getting any help. 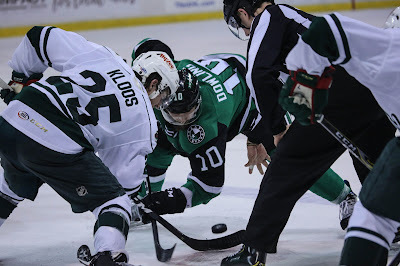 Six and a half minutes into the opening frame, former Stars captain Curtis McKenzie won a puck battle behind the net and centered the puck to Keegan Kolesar who buried a one timer. That gave McKenzie eight straight games with a point. Within the first five minutes of the second period, the Wolves padded their lead enough to seal the deal with their second and third goals. Daniel Carr continued his outstanding season by scoring his 29th goal on the power play, and Zach Whitecloud finished off a 4-on-2 rush that led to the goalie decision by Laxdal. 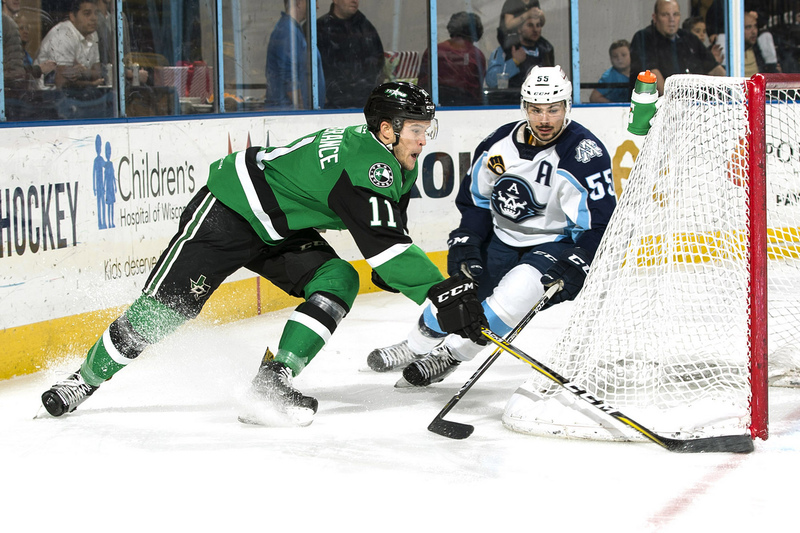 The Stars head back to Cedar Park and will look for a better result against the Milwaukee Admirals on Wednesday. Center Joel L’Esperance rejoined the team in Rosemont prior to the game. Phil Desrosiers relieved Landon Bow halfway through the second period after Bow gave up three goals. Note: After this post was authored but before it was set to be published, Dallas acquired Mats Zuccarello and reassigned Joel L'Esperance to Texas. Both teams were on their way to Chicago today, so L'Esperance should be available. The Texas Stars have lost their two day games in Chicago this season, having improved dramatically in their second bid but still falling to a 3-1 score last week. Perhaps the third time's a charm? The Stars head into Rosemont to take on the Wolves once again in a Sunday matinee to finish out this four-game road trip. They are coming off a shootout loss to Grand Rapids on Friday while the Wolves have been idle since they last played the Stars. As the season winds down to crunch time, points are becoming a valuable commodity, and head coach Derek Laxdal feels that his team is playing well enough to earn them. "You know, our guys are battling," he told 100 Degree Hockey on Saturday. "We ground one out last night, guys played their asses off. We had a chance to win in overtime, and we didn't close it out. Grand Rapids is a good team, but I give our guys full grades for the way they played." Though the Stars ultimately fell in the 4-3 decision, they have to come away from these efforts feeling like they can play with the top teams in the division. "You talk about the captains and the leadership group--that's where that message gets reinforced the most. When those guys bring it up and they talk about it, because they do. And we know as a coaching staff we can rely on these guys to reinforce the message in all aspects." That message will need to be lived out against another top team in the division. 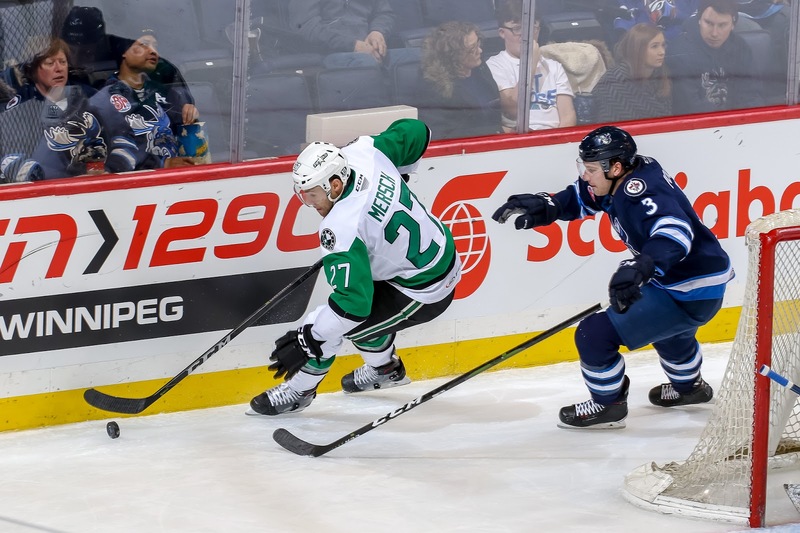 Two former Stars in Curtis McKenzie and Max Lagace got the better of their old team last week. If the Stars can push through exhaustion to pull out two points in Sunday's tilt, it will give them five total in a meat grinder of a road trip. "We're finding ways to get points here and there. It's always tough on the road in the second half here. This is where you see your guys take the baby step. Guys like Caamano, Gurianov, and Mascherin, some of your defensemen--Bayreuther. Any time you play these hard games it's only going to help their development." 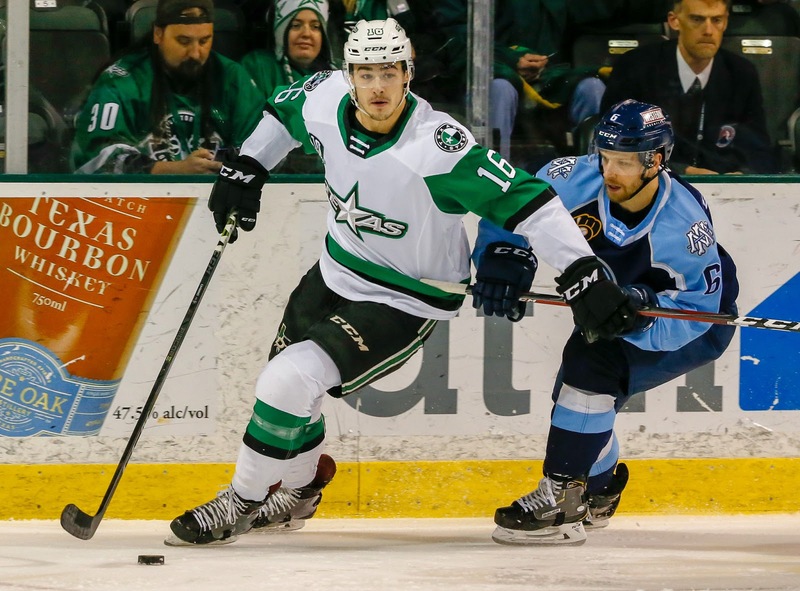 This afternoon, amid news of two deadline deals for Dallas, the Texas Stars also made an unrelated transaction. This was a simple move to send goaltender Colton Point to the ECHL. With the return of Landon Bow, Texas was carrying three goalies. It's a completely expected and unsurprising move. During his callup, Point made a single appearance for just a minute after Philippe Desrosiers lost a skate blade in Iowa. As a sidenote, I had to dig all the way back to October to find a photo of Colton Point playing at H-E-B Center. His last time playing at home for Texas was October 27th. The Texas Stars, American Hockey League affiliate of the NHL’s Dallas Stars, announced today that goaltender Colton Point has been reassigned by the Dallas Stars from the Texas Stars to the club’s ECHL affiliate, the Idaho Steelheads. Point, 20, saw action in five AHL games this year, totaling a 1-3-1 record, 3.96 GAA, and .854 SV%. The rookie made his AHL debut against the Milwaukee Admirals on Oct. 6 and took the game to a 4-3 decision in overtime. In the ECHL this season, the North Bay, Ontario native has played 10 games for the Steelheads earning a 5-1-0-1 record, 3.31 GAA, and .884 SV%. 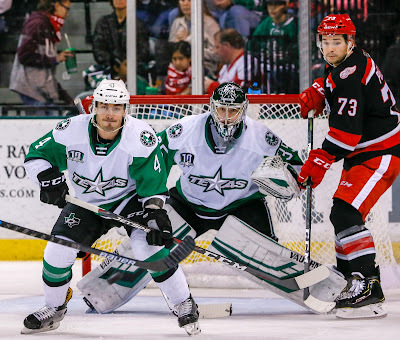 It was former Texas Star Derek Hulak with the deciding goal in the fifth round of the shootout tonight as the Griffins knocked off the Stars 4-3 in Grand Rapids. Texas earned a point in the effort, scoring twice in the second period to come back from a 3-1 deficit. The power play was a key element for both clubs tonight as three power play goals were scored on seven combined opportunities. Landon Bow returned to the net for Texas, stopping 28 of 31 in the shootout loss. Texas opened the scoring early in the first period. Michael Mersch was rebuffed on a wrap around attempt but dished to an open Denis Gurianov to make it 1-0. Grand Rapids would have its way with Texas for the rest of the period. Givani Smith, brother of former Star Gemel Smith, tied the game lofting one past Landon Bow six minute later. In the 13th minute, Libor Sulak just waltzed in from the blue line, ripping one in for the 2-1 lead. Finally, the Grand Rapids power play activated for a literal last second goal in the period. Turner Elson flicked the puck in with less than a second remaining on the clock for the 3-1 lead. The Stars battled back in the second period thanks to their own power plays. Niklas Hansson made a big but legal hit early in the frame and started the Griffins down a road of bad behavior. Chris Terry's unsportsmanlike coming off the hit, as he sought to fight an unwilling Hansson, triggered the game's first goal. Justin Dowling, from down low, cut the lead to 3-2 Grand Rapids. Hansson himself would get in on the scoring, also on the power play, flinging the puck in from the point for the 3-3 tie at the end of forty minutes. A quiet third period on the scoresheet gave way to overtime. Nicholas Caamano had the most notable moment of the frame as he tussled with Turner Elson. Justin Dowling and Brad McClure each had fantastic chances in the OT period. Dowling broke in alone but ran out of room in front of Rybar. McClure couldn't beat Rybar off a slick pass from Travis Morin. Travis Morin and Joel Hanley were the Stars' goal scorers in the shootout. It was Hanley's first career shootout attempt. The game winner came as Derek Hulak bored a hole through Landon Bow. It appeared Bow had the save until it trickled out from between his legs and into the net, an inglorious way to go down after a solid effort. Texas heads to Chicago for an afternoon game against the Wolves on Sunday. Joel Hanley took a big hit in the third period and went down the tunnel with the trainer. He would return. 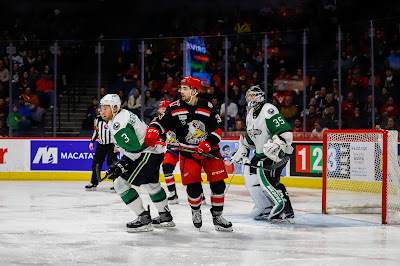 Texas is getting some reinforcements for tonight's game against the red-hot Grand Rapids Griffins, but unfortunately it's not where they need them the most. Landon Bow returns to the fold with two more games of NHL experience under his belt. Philippe Desrosiers has performed admirably in his absence. The fourth-year tender now owns the best save percentage and goals against on the team (.912 and 2.49, respectively). Unfortunately, his efforts have not been rewarded. Texas has been hurting in their skating corps. Robbie Payne, Spencer Naas, and Brad McClure are all players taking regular shifts who were not expected to be anchoring bottom six at this point. With no malice toward those players, Texas is definitely missing the talents of Joel L'Esperance, Colin Markison and Sam Laberge. The Stars have scored more than 2 goals just twice in their last ten games and got shut out for the first time all year in Manitoba. Scoring is at a premium for Texas and the same players can't be the engine every single night. Rookie players like Nick Caamano and Adam Mascherin should see this as the perfect opportunity to make their mark on this club. If they don't, everyone might be golfing by mid-April. 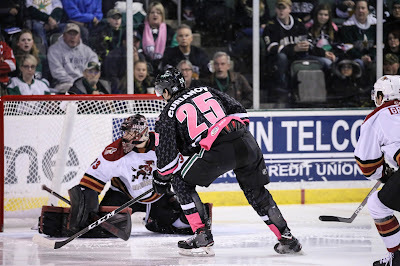 The weekend has already started for the Texas Stars with today's matinee game, but the rest of the three-game set will be a little bit easier with Landon Bow back between the pipes. Bow, who was recalled to Dallas on emergency conditions, did not start any games in Dallas. In relief duty, he was very solid with 1.03 GAA and .947 SV%. Of course, much of that was mop-up work so score effects definitely came into play. Philippe Desrosiers has played well in Bow's absence but has been leaned on hard. I would expect Bow to start tomorrow's game in Grand Rapids as well as Sunday's back in Chicago. 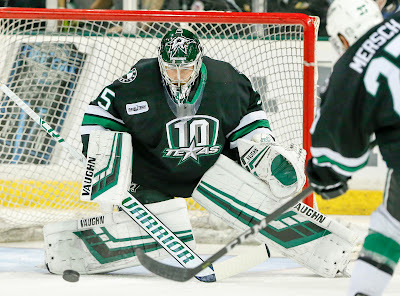 Dallas Stars General Manager Jim Nill announced today that the club has reassigned goaltender Landon Bow to the Texas Stars, Dallas' top development affiliate in the American Hockey League (AHL). Additionally, the team has activated goaltender Ben Bishop from Injured Reserve (upper body). Bow, 23, made his NHL debut for the Stars this season and has appeared in two contests, logging a 1.03 goals against average and a .947 save percentage. In 34 games played for Texas this season, he has produced a record of 18-10-4 with a .902 SV%, a 2.70 GAA and one shutout. Though today's tilt was much more competitive than the last time the Stars played a day game in Rosemont, the result was still the same. 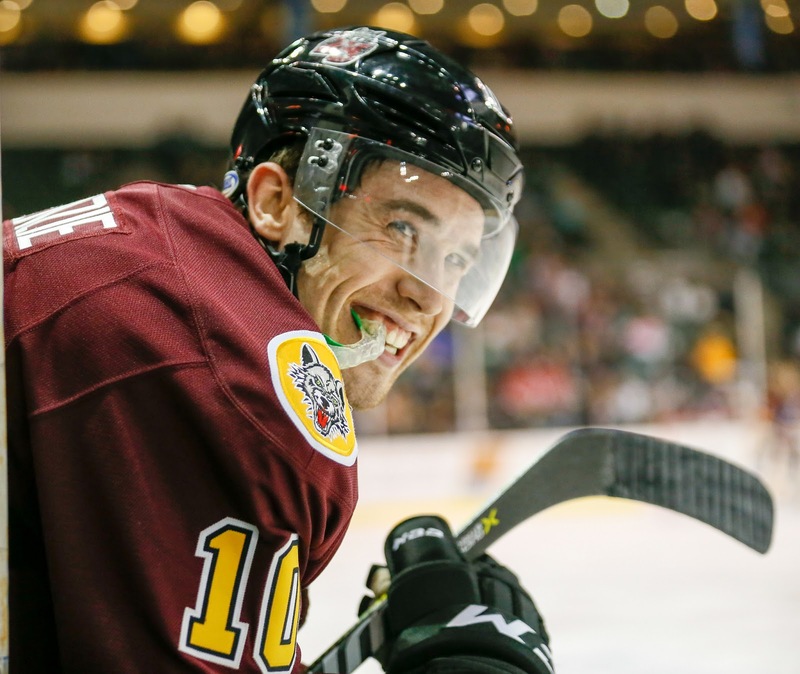 The Chicago Wolves beat Texas 3-1 to put them even with Iowa at second place in the Central division with one game in hand. Texas, on the other hand, can't seem to find consistency while a playoff spot is still there for them to take. It's almost as if they're missing the league leader in goal scoring. 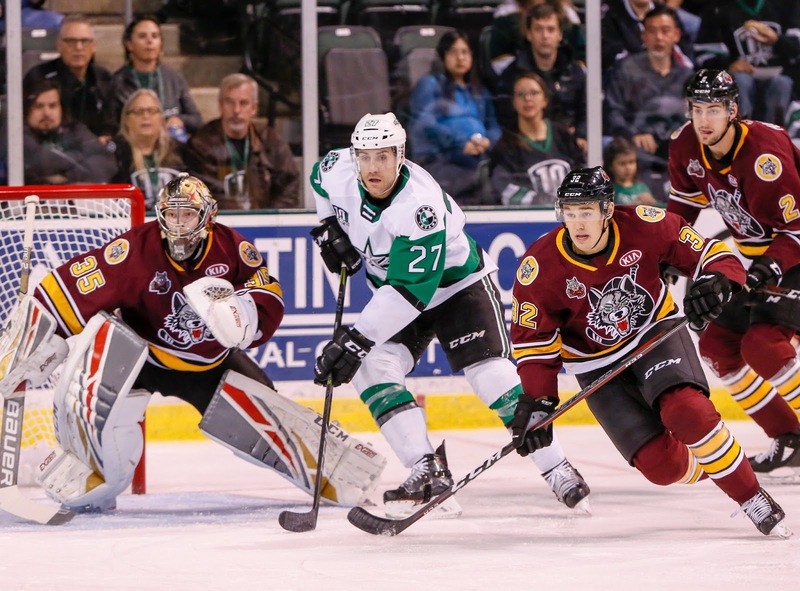 Two familiar faces led the charge for the Wolves--Curtis McKenzie and Max Lagace. 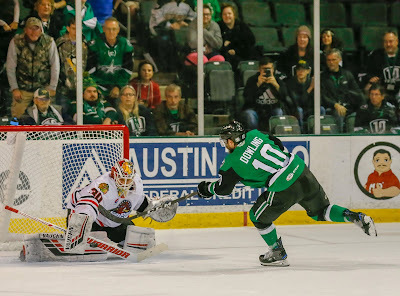 The former Stars captain scored his first goal against his old team in the second period to go with Gage Quinney's shorthanded tally. Both goals in the middle frame gave the Wolves the lead, which they never relinquished. Lagace was spectacular in his 38-save effort. Many of those shots were from the perimeter, as the Wolves were doing a stellar job of keeping the Stars to the outside for the most part, but Lagace's glove was on point. 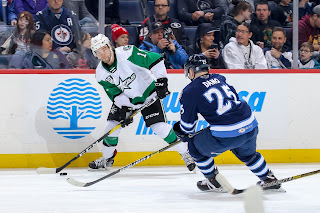 The only time the Stars managed to get a puck passed him was early in the first period when defenseman Joel Hanley fired one through traffic, and Hanley was heavily screened. It was great timing for Hanley after he signed a two-year deal to stay with the Stars yesterday. The chances were there in the third period for the Stars to find the equalizer, but Lagace met them every step of the way. The closest they came was when Travis Morin hit a post with less than five minutes to go, and his line-mates scrambled to make a play behind the net. In the end, Daniel Carr's empty-netter sealed the deal and padded his league-leading 64 points. The Stars head to Grand Rapids tomorrow to take on the division leader. 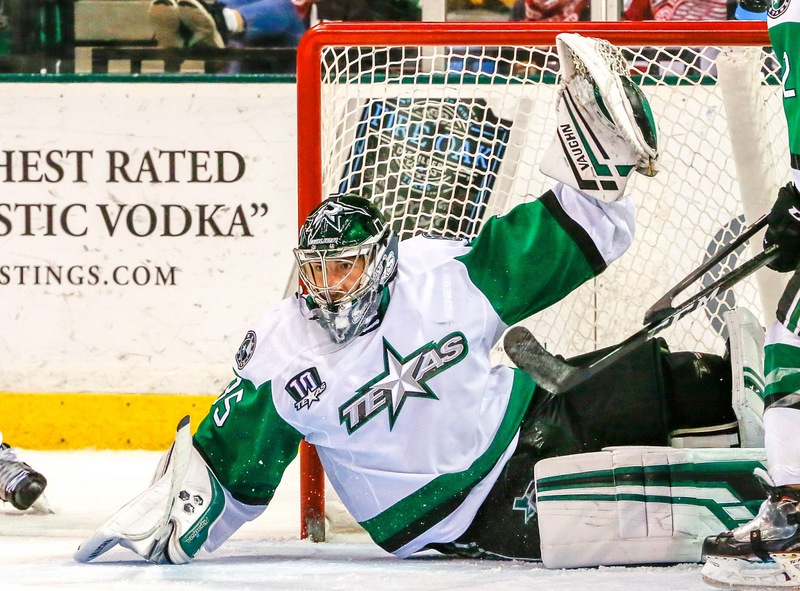 Day games in the Chicago area have been unkind to the Texas Stars in recent memory, to put it gently. But that was two months ago, nearly an eternity in AHL terms, and the Texas Stars could be more prepared to weather the storm this time around. No one is punching a playoff ticket for the Stars for the moment, but they have reason to believe they belong near the top of the Central with the Chicago's of the world. For one, they're getting the goaltending they need to make a push. Goaltender Philippe Desrosiers turned in another outstanding performance in Tuesday's win in Iowa. 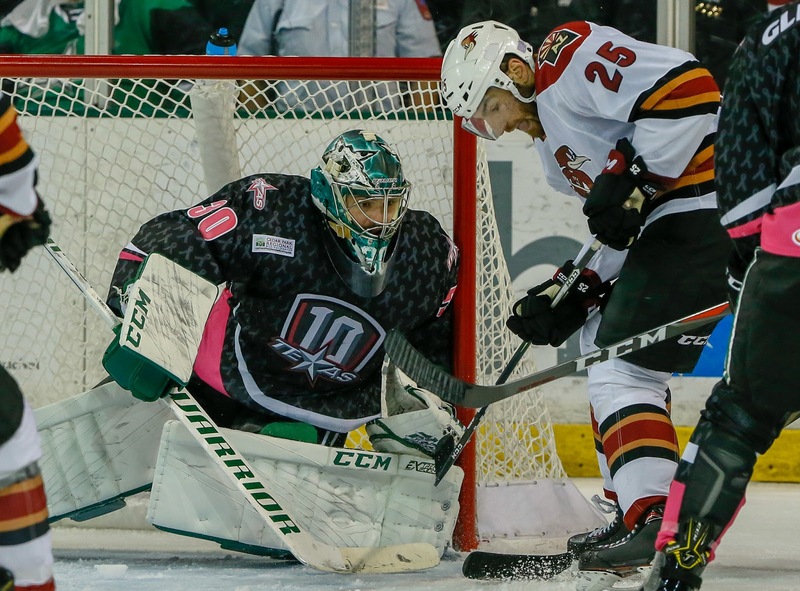 The effort pushed his save percentage to .935 since he took over for the recalled Landon Bow. The Wolves are also coming off a win over the Wild in their most recent game on Sunday. Winger Daniel Carr continues to be an offensive force, leading the AHL with 63 points. Chicago is also formidable on special teams, coming in at tenth in the league on both the power play and penalty kill. However, recent weeks have shown that these two teams are playing on a similar level. The Wolves are 5-4-1-0 in their last ten while the Stars are 5-5-0-0. This is another one of those games that coach Derek Laxdal describes as a four-point game. Time will tell if they can rise to the occasion on a Thursday morning to take care of business. The puck drops at 11:00 AM CST. 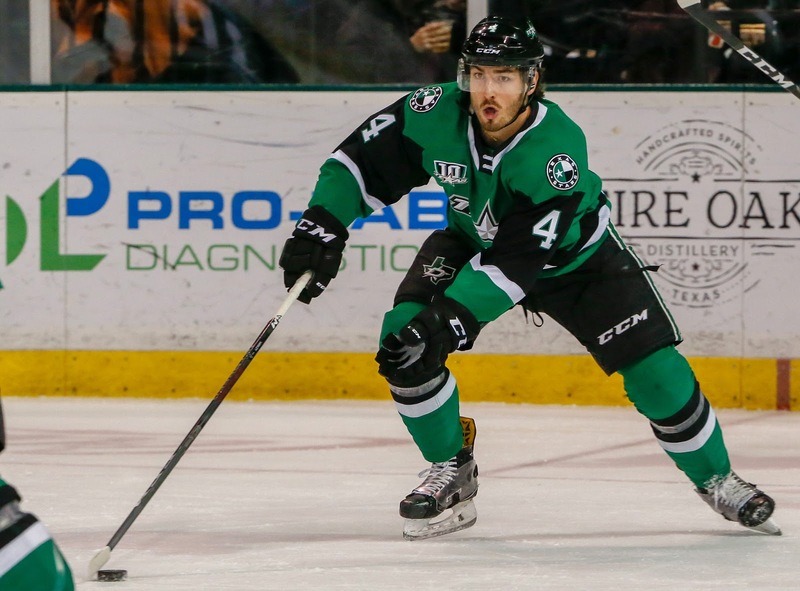 The Dallas Stars announced this afternoon that they have signed defenseman Joel Hanley to a two-year contract extension. Both years are two-way. With the deal, Hanley is now under contract with the Stars until the 2020-2021 season. Hanley was pressed into service in Dallas this season for 16 games but is more likely to fill the veteran role in Texas for the coming two seasons. Dallas Stars General Manager Jim Nill announced today that the team has signed defenseman Joel Hanley to a two-year, two-way contract extension, which will run through the 2020-21 season. Hanley, 27, has appeared in 16 NHL games with Dallas this season, recording nine shots on goal, 16 blocked shots, 16 hits and an average time on ice per game of 13:42. 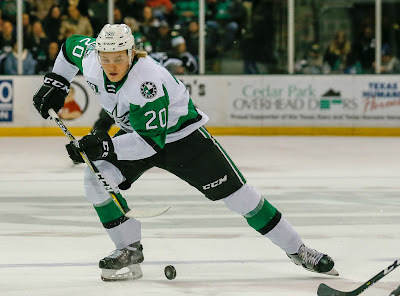 The defenseman has also registered 13 points (2-11=13) in 36 games with the Texas Stars, Dallas' development affiliate in the American Hockey League (AHL). Hanley is tied for third on Texas with a +7 plus/minus rating so far in 2018-19. Hanley has recorded six points (0-6=6) in 38 career regular-season NHL contests with Montreal, Arizona and Dallas. The blueliner has also earned 90 points (13-77=90) and a +40 rating in 295 career AHL regular-season games with Portland, St. John's, Tucson and Texas. Additionally, Hanley has skated in 18 career games in the Calder Cup Playoffs, recording five points (0-5=5). The 5-foot-10, 190-pound native of Keswick, Ontario was originally undrafted and was signed by Dallas as a free agent on July 1, 2018. Brad McClure was the hero of overtime for Texas this evening, but it took a village to get him there. Phil Desrosiers had to be stellar in the contest, stopping 39 of 40 shots against him to earn his fifth win of the year in his sixth straight start. Desrosiers fended off shots from JT Brown and Nate Prosser in the process, who hadn't seen time in the AHL since 2013 and 2012, respectively. Kahkonen was no slouch in the Wild net himself, stopping 35 of 37. The Stars and Wild skated the first seven minutes of the game without a stop. Colton Beck had the best chance of the sequence, hitting iron behind Desrosiers. The Wild hit the post again in the frame, but it was Texas emerging from the first with a lead. On the power play, Ben Gleason fed Justin Dowling down low. The captain took a stride in from the left wing dot and wristed one past Kahkonen. As the second began, Iowa got a power play goal of their own from Kyle Rau, brother of one-time Houston Aero Chad Rau. The tie score held for most of the rest of the contest. In the second, Erik Condra rushed the net and bowled into Iowa goalie Kaapo Kahkonen. It looked like CJ Motte might be called into the game, but Kahkonen was deemed good to go and finished the game. Phil Desrosiers, meanwhile, lost the blade from his right skate in the third period and came out for just under two minutes as the equipment managers fixed up the busted blade. Colton Point faced no shots during his quick appearance. Texas had a late chance for the go-ahead goal with a power play opportunity under five minutes left the game. Coming up empty, they would head to overtime. A frenetic period it was. Iowa had an early chance, followed by a Justin Dowling breakaway the other way. The ultimate game winner came off the stick of McClure in the period's fourth minute. Off the pass from Dillon Heatherington, McClure scored off his own rebound swooping left to right by Kahkonen for the victory. Texas heads to Chicago for a day game on Thursday morning. The lone game in the AHL this evening finds the Texas Stars on the road against the Iowa Wild. Texas comes into the contest having dropped out of playoff position and just two points ahead of last place in the division. 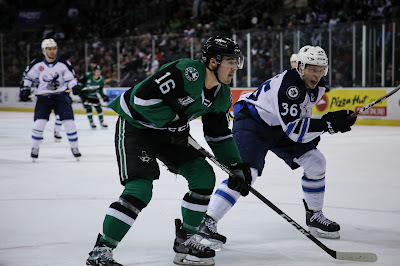 The rising fortunes of the San Antonio Rampage and Manitoba Moose have given way to an absurd race for fourth place in the Central. Just five points separates a playoff team from the last spot in the table. The Wild come into the game on a five-game point streak, albeit limpingly. They lost Saturday in the shootout 5-4 after leading against Rockford. Sunday they fell in OT against Chicago. Nevertheless, they are the only club in the AHL with a top five power play and penalty kill at home. They've also scored a league-leading 106 goals at home this season. Point being: this is a tough two points to get at Wells Fargo Center. That toughness is amplified by the struggles Texas has found on the road. Texas still owns the #4 road power play and #10 road penalty kill, so special teams isn't a sore spot there. It's sure to be interesting when either team goes to the box. It's unclear if Colton Point will get a start any time soon. The rookie hasn't earned the confidence of this coaching staff, and Philippe Desrosiers has been playing more confidently himself in these past few weeks. Regular starts have given him a chance to fit into a groove. While he may not have a future in Dallas, the rest of the AHL season could set him up very nicely for a prove-it NHL or AHL deal next year. Texas fell 4-1 to the visiting Tucson Roadrunners in a game that did not by all account match the score line as far as the eye test went. Tucson opened the scoring with a deflection goal early in the first. Tyler Steenburgen put one past Desrosiers off the shot from captain Dakota Mermis. Texas’s opening tally came off the rush of Denis Gurianov. The speedster broke past three Tucson defenders and into the corner. He dished to an open Justin Dowling in the slot. The Stars captain made no mistake on the play, burying his 10th of the year for the tie score. Ben Gleason had Texas’s best chance in the rest of the period. On the power play, the defenseman rang the right post hard sneaking down from the point. The score would stay tied after one, however. 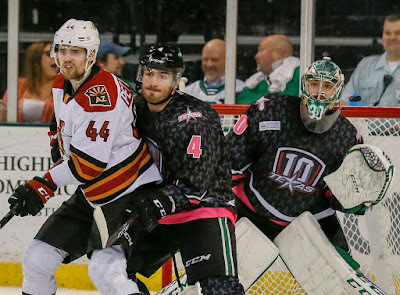 Tucson and the Stars started getting a bit spicy in the second period, trading penalty calls amounting to ten minutes in the box overall. None of the penalties amounted to any scoring, but the score was not tied at the end of the frame. David Ullstrom scored on a cross-crease pass from Michael Bunting with less than a minute to go as a Tucson power play ended. “We lost a little bit of coverage with a defenseman coming out of the box as a forward,” noted Laxdal. As Texas pushed, Tucson took advantage. David Ullstrom scored his second of the night to make it 3-1 before Jordan Gross made it 4-1 on the power play late. Philippe Desrosiers stopped 22 of 26 on the night. 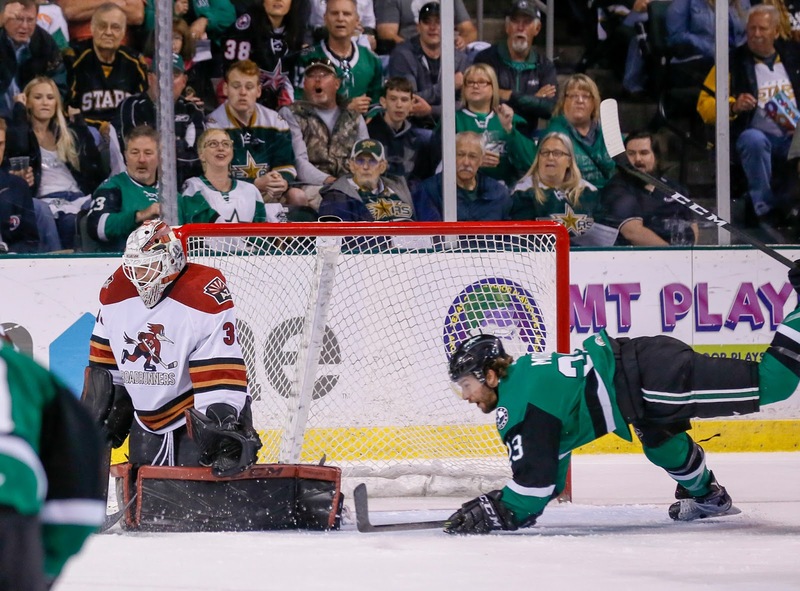 Adin Hill was the first star of the game, closing the door repeatedly on the Texas power play and saving 32 of 33. Texas hits the road for a few games, beginning Tuesday in Iowa. Texas was no worse for wear last night after the afternoon recall of Joel L'Esperance. Huge credit goes to Phil Desrosiers, obviously, with the shutout effort. Big ups also to Robbie Payne and Brad McClure, who each had their first goal and point, respectively, in the AHL. When the chips are down, Texas is looking to its extended depth to bring scoring. The Stars had players stepping up all over the lineup, including veteran Travis Morin playing center for the first time in a few years. "I thought [Morin] showed a lot of leadership stepping up and playing a solid role in the middle," said Coach Laxdal last night. "Everybody stepped up in their role tonight and responded, so we have to bring the same game-plan [Saturday] night." For tonight's game, it shouldn't surprise anyone to see Phil Desrosiers come down the tunnel first again. "I work so hard for this, so it’s pretty easy to play every night," he said. "That’s what I like, so it’s easier to get in and be in every game." The fourth-year goalie has now started four straight and won his last two with two goals against on 59 shots total. Two wins this week have vaulted Texas to 4th in the division. They can't catch third with a win tonight, but they need the points to hold on with 4th through 8th place spanning just 3 points total. The Texas Stars scored twice in the second period to beat the slumping Tucson Roadrunners 2-0 on Friday night. Goaltender Phillippe Desrosiers, who has started the last four games for the recalled Landon Bow, continued his strong recent play and notched his second AHL shutout with a 29 save performance. With the call-up of Joel L’Esperance to the Dallas Stars on Friday, the coaching staff had to reconfigure a couple of lines. The third line, centered by Robbie Payne, was the best line for the Stars and created chances on virtually every shift. Payne was rewarded as he roofed one nearly eight minutes into the second period to pick up his first career AHL tally. His marker proved to be the game-winner. 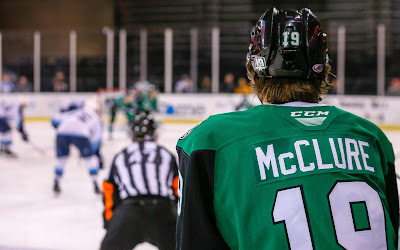 Forward Brad McClure tallied his first AHL point with an assist on the play. Winger Michael Mersch also reached his own personal milestone as he scored on the power play late in the middle frame to bring his career total to 100. Desrosiers was right to give credit to his teammates. They mostly kept Tucson to the perimeter in the defensive zone and were quick to clear pucks. Early in the game, defenseman Niklas Hansson faced a 3-on-1 rush and played it perfectly, forcing the shot to far post, which gave Desrosiers the easy save. Tucson forward Lane Pederson also clanged a post that’s still ringing from the slot late in the opening frame. Other than that, Desrosiers was flawless. The Stars had outshot the Roadrunners by a sizeable margin headed into the third period, but the ice tilted in Tucson’s favor from there. The Roadrunners completely controlled play and had the Stars on their heels. They outshot Texas 12-4 in the frame, but Desrosiers stood tall. Late in the period, Tucson had a glorious chance to cut the lead in half as Michael Bunting stepped out of the penalty box. He found Jeremy Gregoire as the trailer near the slot, and Desrosiers came out confidently to challenge the shot. “I’m not very big, so I have to challenge the shooter,” explained Desrosiers. The Stars complete the weekend set against the Roadrunners on Saturday at 7:00 PM CST. Center Joel L’Esperance was recalled to the Dallas Stars just prior to the game. Update: Denis Gurianov was sent down to Cedar Park late this morning and figures to draw into the lineup. Joel L'Esperance has been recalled to the NHL as well. 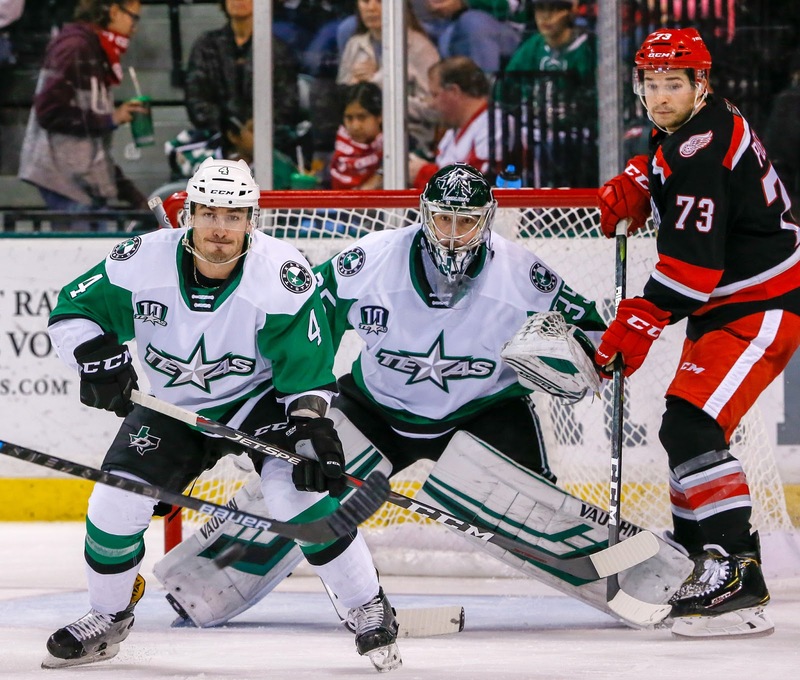 A 2-2-0-0 road trip is much more palatable than the 0-for-5 egg the Texas Stars laid a few weeks back. After a 3-2 win in Rockford on Tuesday to give the Stars their second win in a jaunt through the central, they almost certainly have to be thinking four points in two games against the Tucson Roadrunners at home. Not only is the clock ticking on the season, the Stars are also looking at another four-game road trip after this weekend home set. With how they've performed on the road this season, not to mention a 3-7-0-0 record in their last ten games, it's not hyperbole to suggest that the stakes headed into Friday are about as high as they can be in a regular mid-season game. The good news is that the Stars still have Joel L'Esperance, the league leader in goals with 27 tallies. 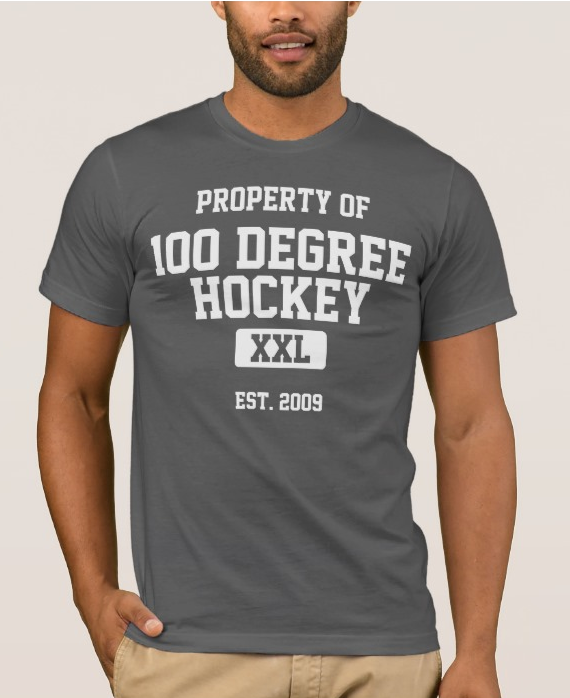 As long as L'Esperance continues to park his imposing frame within ten feet of the crease, he can drink any goaltender's milkshake, even a stalwart like Tucson's Adin Hill (.910 SP). The bad news is that the Stars are slightly shorthanded. Bottom six speedster Colin Markison continues to nurse his lower body injury, and number one goalie Landon Bow is still with Dallas. Phil Desrosiers turned in a nice 28-save effort against Rockford and could start both games against Tucson. The Roadrunners don't want to hear anything about being shorthanded. In what seems to be an annual tradition, the Coyotes are dealing with several injuries and have called up several AHL players as a result. All Star defenseman Kyle Capobianco, who scored twice in two games against Texas this season, was recently ruled out for the year due to a right leg injury. To give perspective, Tucson only dressed 17 players on Tuesday in a shootout loss to San Jose. The Stars need to seize the opportunity here. 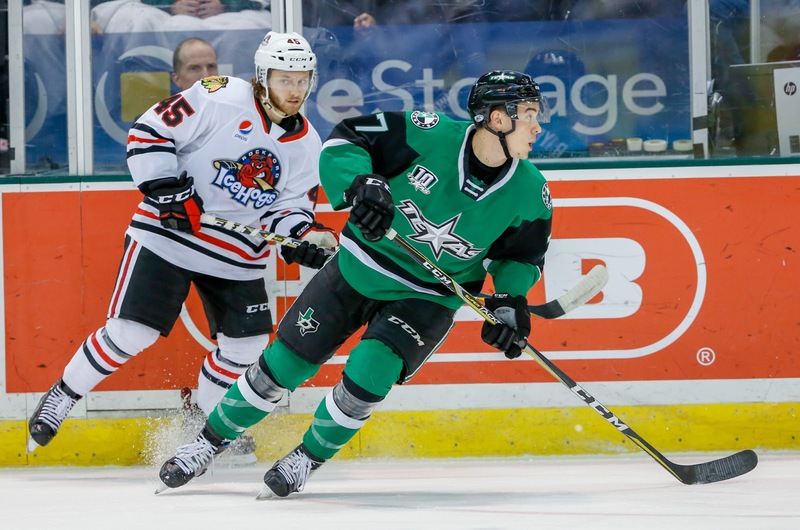 Texas polished off their trip with a win in Rockford, a relatively rare road win for the Stars. The scoring was evenly spread across the periods, one in each, en route to a 3-2 victory. The power play, ranked second in the league this year, activated twice on six opportunities. The Stars never trailed in the contest as goaltender Philippe Desrosiers stopped 28 of 30 shots against him. Michael Mersch had a three point game with a goal and two assists. Mersch got things started in the first with a tip effort on a shot from Niklas Hansson. Rockford tied things up on the power play in the second, but Texas answered quickly. Travis Morin potted a rebound off Mersch's initial shot at the net. Each club would score once in the third period. Joel L'Esperance scored his league-leading 27th goal of the season, a power play marker in tight off Ben Gleason's initial shot. It was the ultimate game winner in this one as Rockford would score once more but be unable to find the equalizer. Texas heads home for two games against the Roadrunners this weekend. The club is still seeking to move back into playoff position. They've got games in hand, but the time to gain on the teams ahead of them is dwindling. With a single win under their belt, Texas has already outperformed their last road trip. Last time out, Texas dropped five in a row and had eight straight road losses going back to December. A strong performance from their clear starter, Landon Bow, and a goal by rookie phenom Joel L'Esperance ended that skid in Milwaukee on Wednesday. This weekend, Texas heads north of the border to face Manitoba without Landon Bow, who is still on recall to the NHL as of this morning. 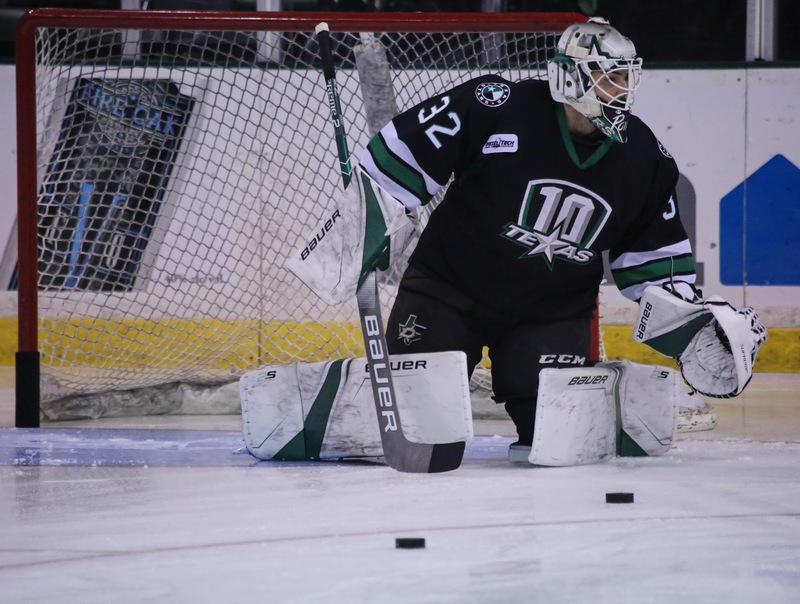 Colton Point has been recalled from Idaho, and fourth-year man Philippe Desrosiers is the leading masked man for Texas this weekend. Even though Texas isn't in the Pacific anymore, the battle of points vs. points percentage rages on. Sixth in the division by points, Texas still has three games in hand over most teams ahead of them. If they win at their current percentage, they're a playoff team in April. Manitoba, on the other hand, is unlikely to be a playoff team. However, that doesn't mean Texas can write them off. Manitoba has taken two of the three games this season, including a really tough shootout loss in Cedar Park to end their home point streak. Following that win, Manitoba collected 11 of 12 points in their next six games. They followed that with just four points in the next six after that. 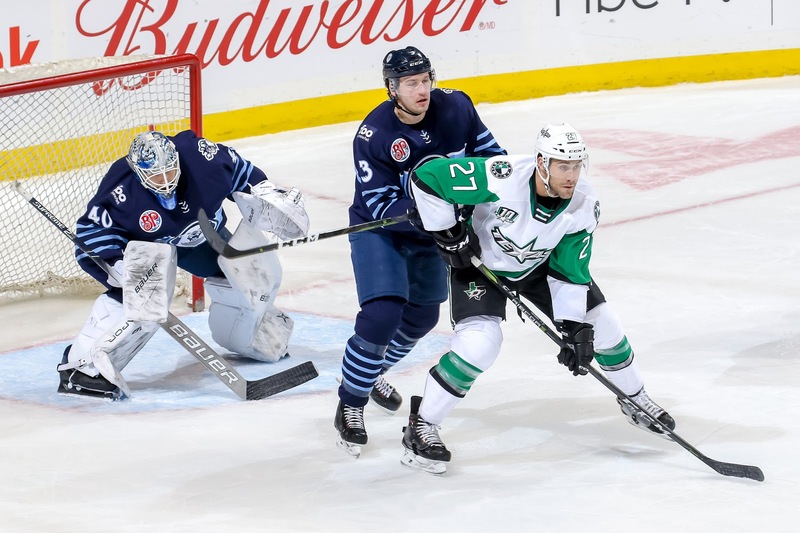 The Texas Stars kicked off their four-game road trip through the Central on a positive note, eking out a 1-0 win over the Milwaukee Admirals. The victory gives the Stars a 4-0-2 record against the Ads this season. Goaltender Landon Bow was the best player for the Stars in the contest. He recorded 29 saves and notched his second career shutout. Rookie forward Joel L’Esperance scored the lone goal in the contest one minute into the first period. Defenseman Dillon Heatherington made a nice stretch pass to spring L’Esperance for the partial breakaway. The goal gives L’Esperance his 25th of the season, putting him back at the top of the league in goal scoring for the moment. Not bad for a player who has stated he has no idea where the scoring prowess has come from at this level. Grand Rapids winger Chris Terry was held without a goal in his game on Wednesday and slots in at second. Good news came for the Stars as the captain Justin Dowling was back in the lineup taking draws and making plays. He had been dealing with a lower body injury and was out in the previous game. Winger Brad McClure was called up from the Steelheads and began the game on the fourth line. In the third period, he was promoted to Dowling’s line while Adam Mascherin replaced him in the bottom six. McClure came close to picking up his first career AHL goal with a wrap-around chance in the third period. The scoreboard didn’t show it, but the Stars played a good brand of offensive hockey, particularly in the second period. They had a couple of odd-man rushes to test All Star Troy Groesnick and hit the posts twice. In the end, Groesnick had 27 saves and was every bit as good as Bow. Speaking of Bow, he had to be at the top of his game in the final frame. 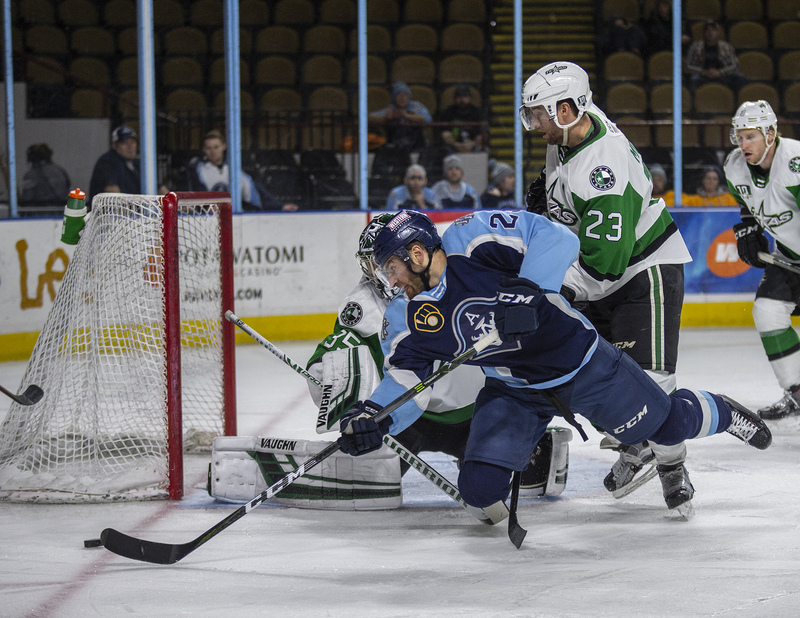 Searching for the equalizer, the Admirals came out of second intermission and amassed ten quick shots within the span of five minutes. Most of them were solid chances, as the Stars were struggling to clear the zone. When the Admirals emptied their net with just over a minute left in regulation, Bow stood on his head once again. The save of the game was one on uber-prospect Eeli Tolvanen, who one-timed a puck that found its way across the crease. The Stars were not able to earn any power play time in the contest and had to kill off two penalties. It was a weird game, but perhaps the Stars proved to themselves that they can win weird. Continuing their road trip, the Stars head to Manitoba on Saturday night.